Now I’ve been dying to try some of our community’s many food trucks’ flare. So when I saw the Facebook event “Clarksville Food Truck Invasion” being hosted by the Clarksville Food Truck Association at Rotary Park in Sango, Tennessee I knew I had to go. I couldn’t have asked for a more beautiful day to spend at a park eating some great food with a new friend. 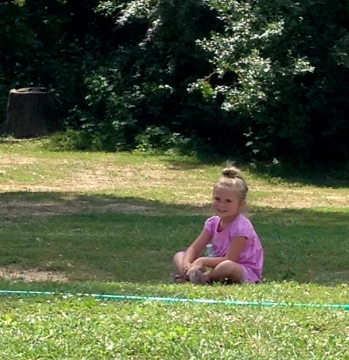 Even better, there were events for kids, along with a small park, so I took my very opinionated niece with me. I couldn’t have asked for a better day. My “peanut” waiting for me to bring her tacos. Here are a couple of my first impressions. They are doing some construction work to Rotary Park which distracted from the overall beauty of the place. I arrived an hour and a half after the event started, but from the looks of things, parking presented a bit of an issue. I was also disappointed to see that several of the food trucks had already left. With all that said, to be completely fair, this was the first event like this in the Clarksville area. I expected some glitches. I am sure they will get things ironed out before the next time. And these things will certainly not prevent me from supporting these kinds of events in the future. 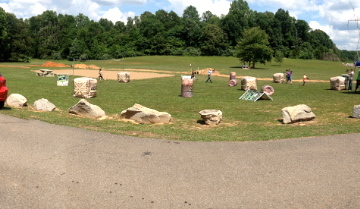 Kids having a great time playing laser tag. So who was there? The flyer advertized that Regenerate, Lunch Rush, La Casa Taqueria, GOOD EATS of Clarksville, Steve’s BBQ, Kona Ice of Clarksville, and Gamez on Wheelz of Clarksville would be in attendance. The Gamez on Wheelz of Clarksville provided the kid entertainment for this event. They had laser tag and a water gun station set up. Regenerate and Steve’s BBQ had already left by the time I made it over to grab something to eat. Because I had eaten at Lunch Rush before, and wasn’t in the mood for a hot dog from GOOD EATS, I knew La Casa Taqueria’s 99 cent tacos would hit the spot. Who wants 99 cent tacos! This girl does! And drum roll please…99 cent tacos did not disappoint! Even my picky niece ate hers without issue commenting on how good it was. Shock! I had the carne asada (steak) tacos served on a corn tortillia. The meat was flavorful with a great balance of toppings to accompaniment. They had a green chili sauce that was just divine. The wait for this truck was particularly long, but it was worth it. Now if they only had fish tacos (hint, hint) I would be in heaven (and back in Tampa, FL). Overall, I can’t wait for them to do this event again. I will make a point of being there before it starts so I can hit up some of the other trucks before they run out of food. 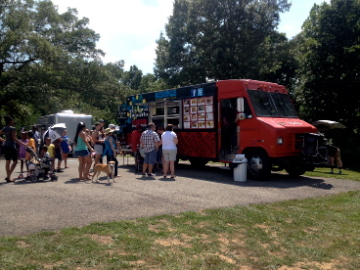 I hope you find the time to support your local food truck and visit our city’s parks. Have a great weekend!